France might be ahead of the curve when it comes to climate policy backlash. President Emmanuel Macron caved to demands from “yellow vests” over planned carbon taxes. More backlash like this could be seen as countries try to phase out gas-powered cars. 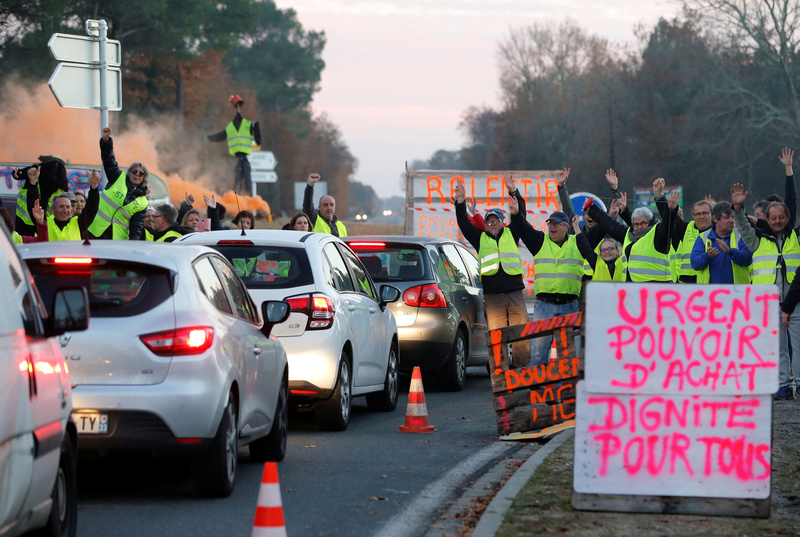 Protesters wearing yellow vests, the symbol of a French drivers’ protest against higher diesel fuel prices, occupy a roundabout in Cissac-Medoc, France, December 5, 2018. The slogan reads “Urgent, purchase power, dignity for all”. REUTERS/Regis Duvignau. Carbon taxes on diesel and gasoline were set to take effect in January. French President Emmanuel Macron agreed to delay implementing the taxes for six months in the face of protests, but that might not be enough to satisfy demonstrators. A view shows a barricade with police forces and protesters wearing yellow vests, a symbol of a French drivers’ protest against higher diesel taxes, during clashes as part of a demonstration near the Place de l’Etoile in Paris, France, December 1, 2018. REUTERS/Stephane Mahe. Australian lawmakers voted to repeal their country’s carbon tax in 2014. Former Prime Minister Tony Abbott led his conservative party to victory in the previous year’s elections on the promise to repeal the carbon tax. 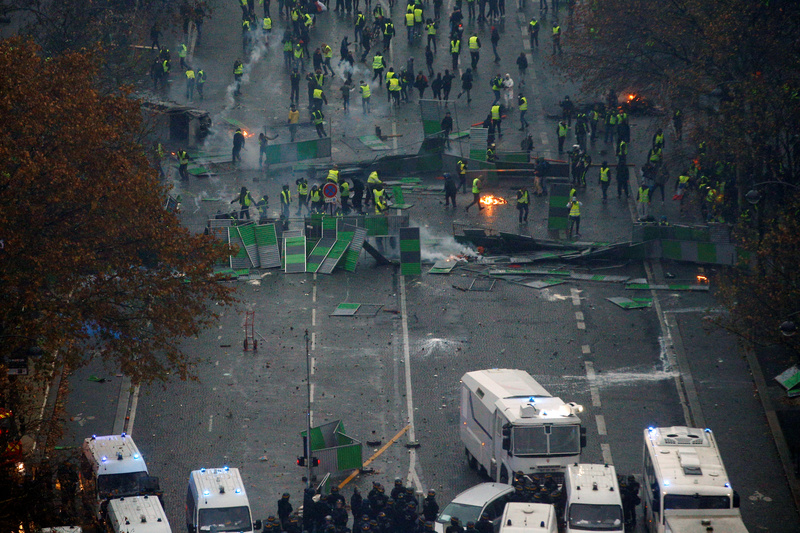 However, France’s violent reaction to new carbon taxes is part of the country’s “romantic” view of political uprisings, according to an expert on French politics and history. Carbon taxes were the breaking point for the thousands of gilet jaunes, or “yellow vests,” who took to the streets in late November. But the protests, considered the worst to hit Paris in 50 years, were also fueled by years of pent-up resentment against Macron’s policies. “Since Macron came to power, he has cut taxes for the rich, ‘simplified’ the Work Laws, cut on pensions, and added billions of euros of new taxes to the working class and middle class,” Chabert said. 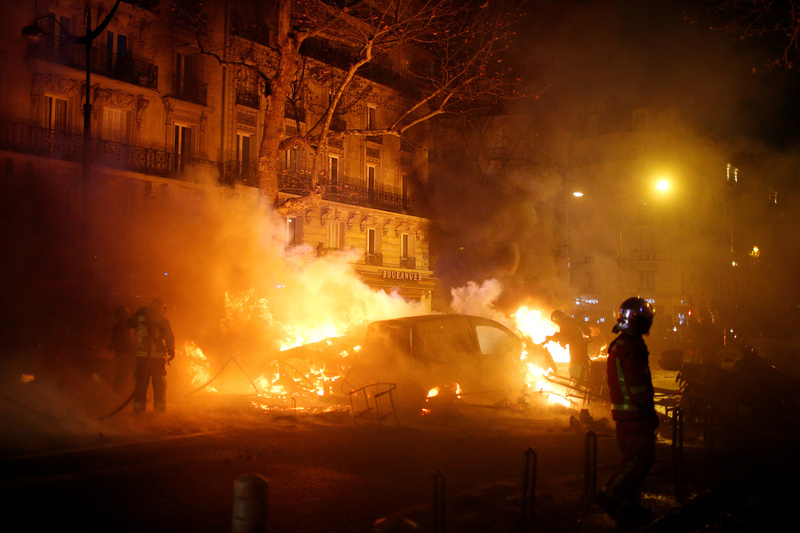 Firemen extinguish burning cars set afire by protesters wearing yellow vests, a symbol of a French drivers’ protest against higher diesel fuel taxes, during clashes near the Place de l’Etoile in Paris, France, December 1, 2018. REUTERS/Stephane Mahe. Many protesters also called on Macron to resign. Yellow vests say Macron is out of touch and centralizing power at the expense of working class citizens. “Emmanuel Macron is a little boy who has always been told he’s the best, he’s always been idolised. He’s never been told ‘you shouldn’t do that’. The guy thinks he’s God!” Claudio, a 47-year-old Frenchman, told AFP. “He deserves to have his head chopped off, symbolically,” said Claudio, who refused to give his full name to reporters. Other protesters compared Macron to Napoleon and the pre-revolutionary Ancien Regime. “He’s the king. It’s as if we’re in the Middle Ages!” echoed Philippe, a 74-year-old yellow vest leader. However, Macron is unlikely to abandon his green agenda. An ardent supporter of the Paris climate accord, Macron pledged to decarbonize French energy use by 2050 and was initially unyielding to protesters’ demands.